The 2019 Ski-Doo Renegade Adrenaline 600R E-TEC ticks all the right boxes for value and fun to own. You want a sled ready to ride every day that handles groomed trails, marginal trails, off trail and occasional fresh feet-deep powder. It must be reliable, stone-cold dependable and fitted with amenities that make hundred-mile morning rides no problem. And, of course, it must offer sporty performance with trail commanding agility and status statement styling. Welcome to the 2019 Ski-Doo Renegade Adrenaline 600R E-TEC. This is a sled aimed at serious flatland riders who demand a mile making sled that is versatile, comfortable and seriously aimed at day-after-day of big mile rides, this is the sled you want. The 2019 Ski-Doo Renegade Adrenaline 600R sits on the latest and best iteration of Ski-Doo’s REV platform, the GEN 4. Every REV update since the original proved better than the previous with this GEN 4 being the best to date. The chassis is balanced front to rear and vastly improved for exacting side-to-side symmetry. Make no mistake, Ski-Doo’s fourth generation REV nails the riding position better than any of the competition. That’s important with the Renegade 600. Without the sheer bullying throttle response of the 850 ETEC twin, the all-new 600 E-TEC relies on rider smoothness and precision handling in and out of corners. 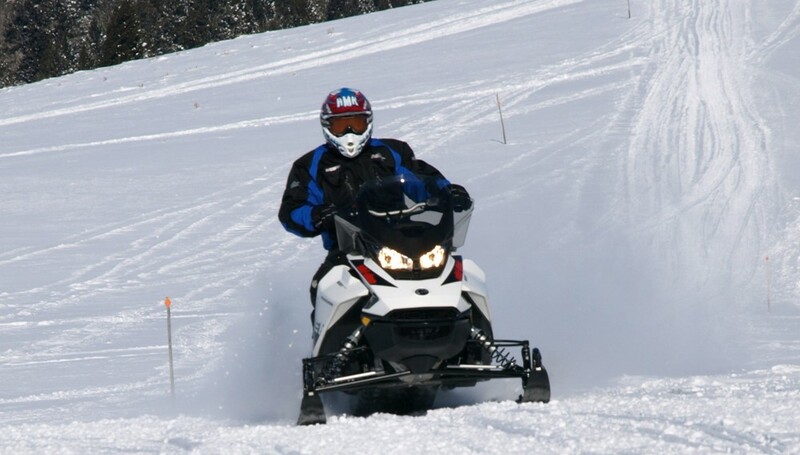 If you are looking for a new sled that will be fun to ride in a group event or out with adventurous buddies, the 2019 Ski-Doo Adrenaline 600R E-TEC deserves a very serious look. For virtually all flatland snowmobilers, the latest Rotax 600 E-TEC with its 125-horsepower will be plenty fast with extremely smooth motoring from its 3400-rpm drive-off, through midrange on up to top end revved out to 8100 rpm. We always liked the Rotax 600s, especially the E-TEC versions and we especially like this newest edition. Of Ski-Doo’s four engine options for the 2019 Renegade Adrenaline – 850 E-TEC (165-ish horsepower), 900 ACE Turbo (150-ish), 900 ACE (95 hp) and the 600 E-TEC (125) – we prefer the new 600. It’s all we need. Actually, it’s more than we need if you consider that this sled uses a 125-horsepower two-stroke twin to push along a 478-pound body. Imagine that power to weight ratio in a sedan. All while maintaining the best in-class E-TEC reputation in efficiency and durability established by its predecessor. The same design parameters applied to the 850 E-TEC carried over to the 600 E-TEC, which gets the latest E-TEC direct injection and the three-position electronically controlled eRAVE exhaust valve system. The on-trail reality tells you that Ski-Doo got this right. The new twin is extremely responsive, belying its 600cc displacement. Yes, the previous 600 was good. 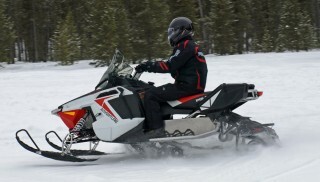 The new 600 is better and we attribute some of that to the precision of the new eRAVE exhaust valve that Ski-Doo claims reacts three times faster. But add in upgrades in exhaust flow, which was redesigned to move expelled gases more smoothly and quickly. 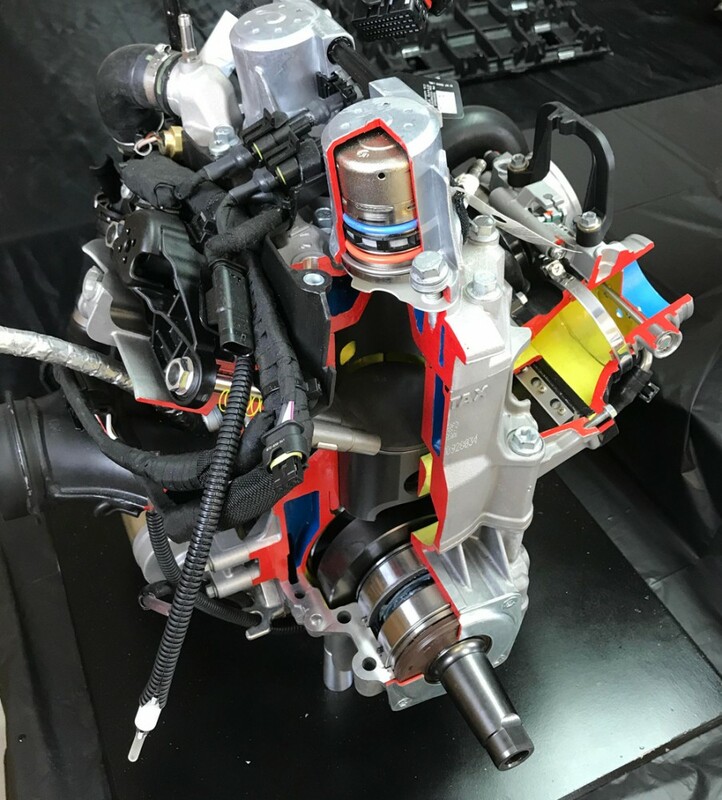 And, you’ll embrace the change to the second-generation E-TEC fuel injection system that mimics the one Ski-Doo designed into its 850 twin. Throttle response is crisp and amazingly quick. These are all characteristics designed to endear this sled to flatland riders. The new engine fits into the GEN 4 platform perfectly as it was meant to for side to side handling. Fitted with the pDrive and QRS clutch system, the powertrain delivers power exactly as you want and expect it. We found no off-putting breaches of indecision in the EFI. As you’d expect with such a system, the throttle pull is easy from drive away to wide open injectors. Of course, there is a 40-something horsepower difference between the 850 and this new 600 E-TEC, so don’t expect trail ripping acceleration when jamming the throttle flipper to the handlebar. Do expect good performance and a fun time throttling in and out of tight S-curve sections and modulating power through a long sweeper. The powertrain and its delivery are very consistent. This new powertrain suits the GEN 4 well, especially the sportier Ski-Doo models like the Renegade Adrenaline. Its standard features make this sled especially fun on the trail and well suited to busting powder down an unmaintained fire road. The Renegade is a versatile sled with a standard 1.25-inch lug on its 137-inch long RipSaw track that can manage off trail as well as long on-trail rides. The rear rMotion features HPG shocks to settle the suspension over it 10.6 inches of rear motion. 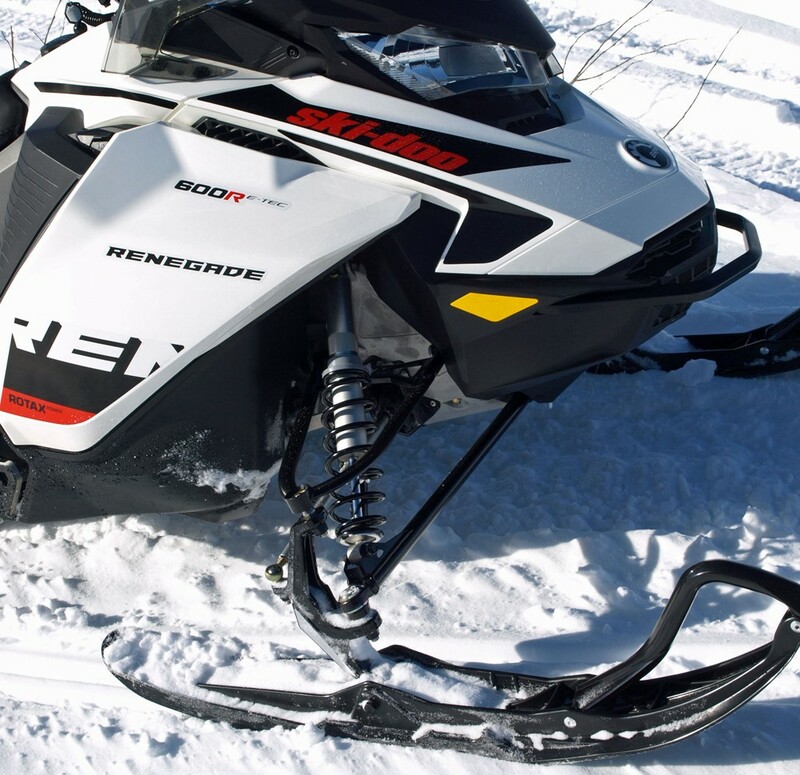 Equipped with an aggressive 42.4-inch ski stance, the 2019 Ski-Doo Renegade Adrenaline 600R’s RAS3 front suspension carries well over rough or groomed trails thanks to its HPG Plus shocks absorbing the sled’s nearly nine inches of travel. The rear rMotion features HPG shocks to settle the suspension over it 10.6 inches of rear motion. 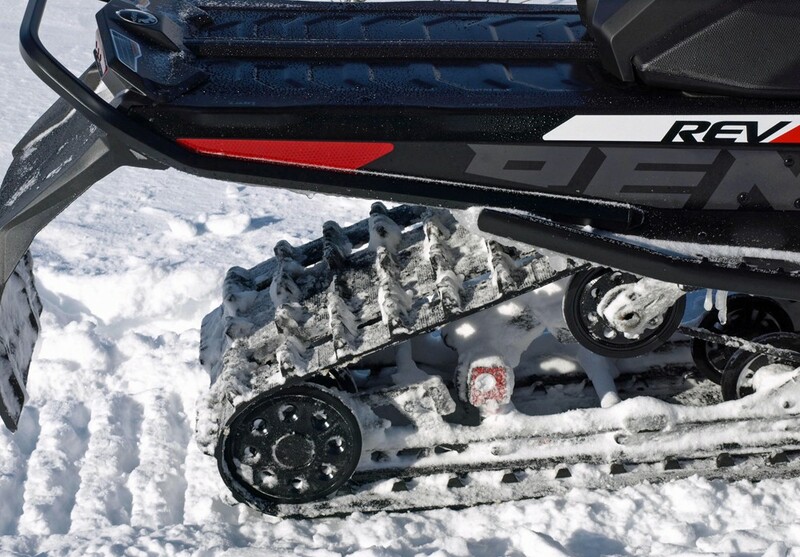 Equipped with an aggressive 42.4-inch ski stance, the Renegade’s RAS3 front suspension carries well over rough or groomed trails thanks to its HPG Plus shocks absorbing the sled’s nearly nine inches of travel. There are features that make the 2019 Ski-Doo Renegade Adrenaline 600R a pleasant ride. 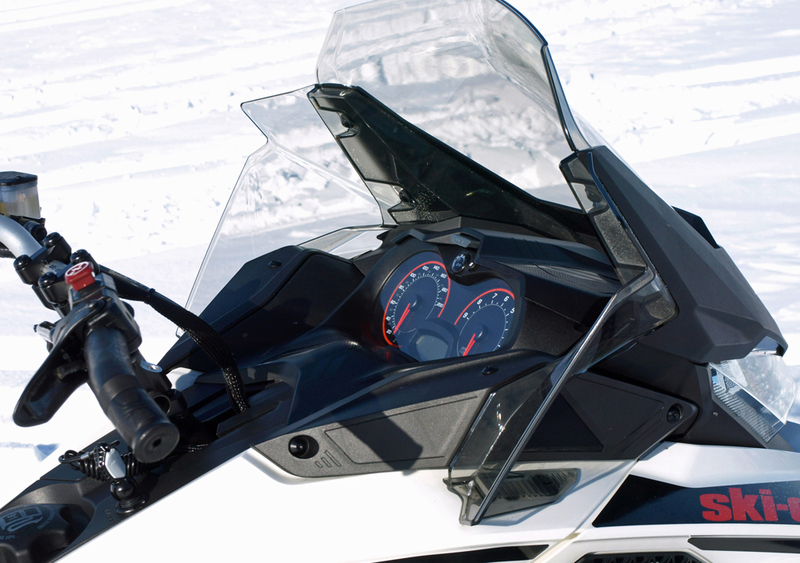 The standard windscreen provides wind-cheating comfort from its 17-inch height and curved side panels that deflect cold from the rider’s hands. We found the Renegade’s Trail Performance seat comfortable for long haul riding and amenable for busting a move or two for active cornering. The aluminum-constructed handlebar offers J-hooks and ready-access to bar and thumb heaters. 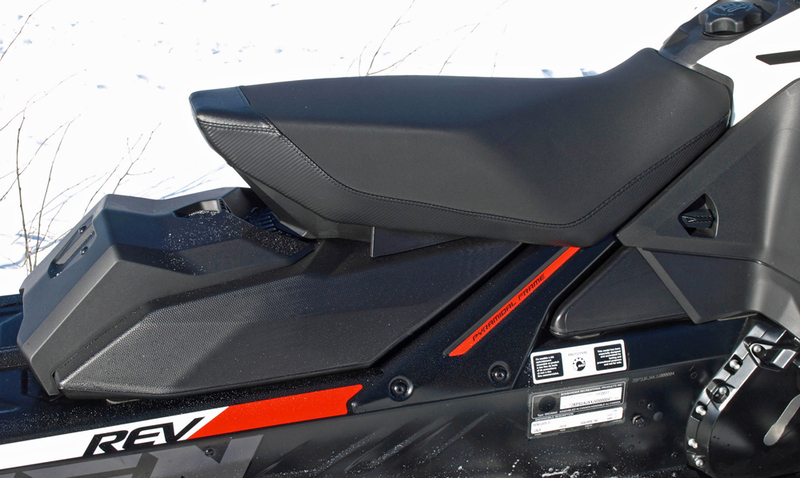 If you wanted to upgrade, we think that Ski-Doo’s multi-position Forward Adjustable Riser for about US$105 is worth a thought as it offers a quick setting for four positions of fore-aft adjustment. We found the Renegade’s Trail Performance seat comfortable for long haul riding and amenable for busting a move or two for active cornering. 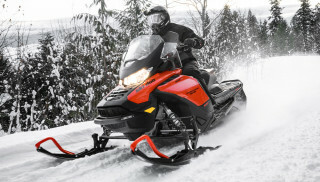 Of course, accessories are key to making any sled “yours.” Since Ski-Doo aftermarketeers designed many of the GEN 4 accessories specifically around the original design of this platform, you’ll find a catalog of precise fitting pieces such as LinQ storage bags and designer skis and shocks. While the base 2019 Ski-Doo Renegade Adrenaline 600R E-TEC may carry a suggested retail of US$11,649, you can add comfort and add-ons for whatever your intended usage may end up being. The standard 17-inch tall windscreen provides wind-cheating comfort and the aluminum-constructed handlebar offers J-hooks and ready-access to bar and thumb heaters. 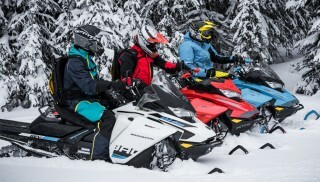 We found the 2019 Ski-Doo Renegade Adrenaline 600R to be a popular ride whenever we had it out for a test ride at our 2019 new sled ride session in West Yellowstone last March. It proved popular because it does virtually all things well and is a very enjoyable sled in all flatland conditions. 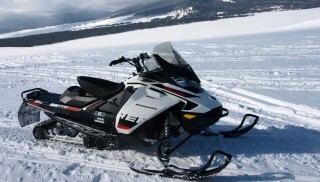 If you are looking for a new sled that will be fun to ride in a group event or out with adventurous buddies, this snowmobile deserves a very serious look. We definitely recommend it.